Surveillance video that captured the fatal police shooting of a homeless man in Venice shows a “physical altercation” between the man and two officers, but an investigation into the shooting is still in its infancy, police Chief Charlie Beck said Wednesday. Beck said he is “very concerned” about the shooting, noting it generally takes “extraordinary circumstances” for police to shoot an unarmed person, and it’s unclear if those circumstances existed in Tuesday night’s shooting. 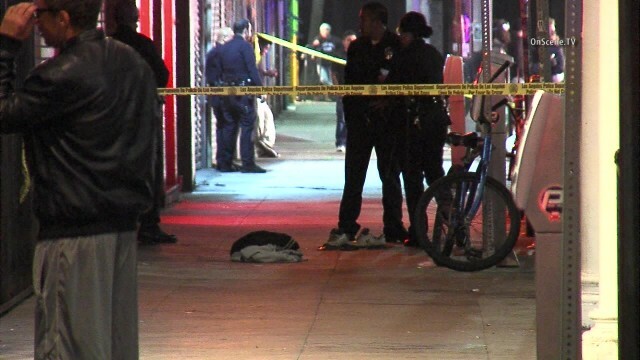 The chief said Los Angeles Police Department investigators have not yet been able to interview the officer who opened fire on the suspect because he is still on medication after being treated for a knee injury suffered in the altercation. The shooting occurred around 11:30 p.m. Tuesday on Windward Avenue just west of Pacific Avenue. Police said two officers initially responded to a call about a person harassing people on Windward Avenue. They spoke briefly to the suspect, who walked away toward the boardwalk, police said. The officers returned to their car but then saw the suspect suspect struggling with someone — apparently a bouncer at the Townhouse bar — on the sidewalk. The officers approached the suspect again and a struggle ensued, ending with the shooting. It’s unclear how many shots were fired. The suspect died at a hospital. The suspect’s name was withheld pending family notification, but acquaintances identified him as 29-year-old Brendon Glenn, who moved to the area from New York City but was homeless and had struggled with drugs and alcohol. Glenn had sought shelter and assistance at The Teen Project’s Venice P.A.D. homeless center, according to the center’s Timothy Pardue. A group of community activists, who have been condemning fatal police shootings of black men across the country, plan to gather outside LAPD headquarters later today to call for a federal civil rights investigation into the shooting. Beck noted that the officer who fired at the suspect in Venice is also black, as was the suspect. Craig Lally, president of the Los Angeles Police Protective League, the union that represents LAPD officers, criticized Beck for his comments about the shooting, saying it is too early in the investigation to suggest the shooting may have been improper. Beck said the department is working with the District Attorney’s Office and the LAPD’s independent inspector general to investigate the shooting. “We will expend all resources to find out the truth of what happened last night on Windward Avenue,” he said. Beck said a town hall meeting will be held Thursday night with LAPD officials and Inspector General Alexander Bustamante to discuss the shooting with residents. City Councilman Mike Bonin is also expected to attend. The meeting will be held at 6 p.m. at Westminster Avenue Elementary School, 1010 Abbot Kinney Blvd.